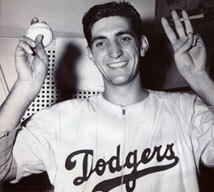 Ralph Branca was well-known during his baseball career as a stellar pitcher, and made the All-Star team from 1947-49. He started the first playoff game in Major League Baseball history, was the youngest pitcher to win twenty games in a season, and was an opening day pitcher in a World Series. He is also, most famously, the pitching part of the most famous home run in Baseball history – “the shot heard around the world” – in 1951. Ralph Branca transformed this unfortunate fame adn notoriety to the benefit of a number of worthwhile causes during the years following his retirement from baseball. Branca was an All-Star pitcher from 1947-49, and was a teammate of baseball pioneer Jackie Robinson, and the two became good friends. He has since been a longtime supporter of the Jackie Robinson Foundation. Branca was inducted to the National Italian American Sports Hall of Fame in 2003.